Yankee Stadium was pretty in pink on August 18, when dozens of breastfeeding moms and their supportive families showed up for the game in hot pink T-shirts. 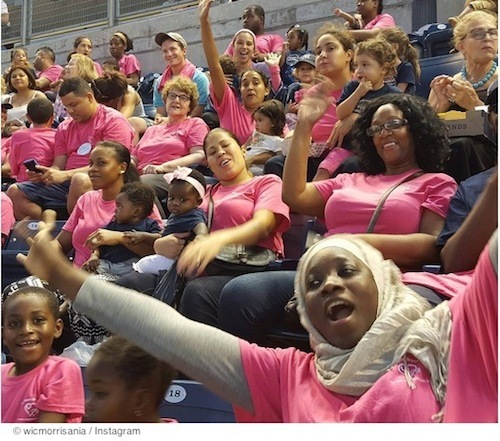 This family-friendly crowd gathered together to celebrate the third annual “Breastfeeding Night with the New York Yankees,” an event orchestrated by the Bronx Breastfeeding Coalition. The annual event is held each year to promote breastfeeding in public with the goal of helping Yankee fans, breastfeeding moms, and their families become comfortable with seeing nursing moms in public places. The pink-clad coalition was seated together just beyond first base, presenting a united “sea of pink” to Yankee fans throughout the stadium. Theresa Landau, representing the Bronx Breastfeeding Coalition, said the event “was great” and the group “got nothing but smiles” from other sports fans at the game. Cindy Marte is a big fan of Breastfeeding Night; she’s attended all three events because going to the first one was a life-changer. When 26-year-old Marte and her 2-month-old daughter, Mia, went to the first Yankee Stadium Breastfeeding Night in 2013, she’d been sneaking into fitting rooms, restrooms, or the car to feed her new baby. None of her friends were breastfeeding their babies and Marte didn’t see a lot of it happening in public. Maybe all that nurturing love and community spirit worked in favor of the Yankees, too. They beat the Minnesota Twins 8 to 4. Bertsche, Rachel. "Photos: Breastfeeding Moms Take Over Yankee Stadium." Yahoo! Parenting. Yahoo!, 19 Aug. 2015. Web. 28 Aug. 2015. "Breastfeeding in public." WomensHealth.gov. Office of Women's Health / US Department of Health and Human Services, Aug. 2010. Web. 28 Aug. 2015.